Quantum field theory, one of the most rapidly developing areas of contemporary physics, is full of problems of great theoretical and philosophical interest. 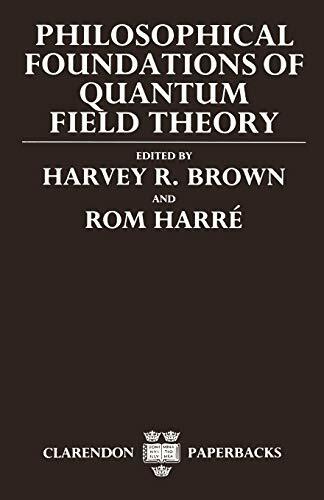 This collection of essays is the first systematic exploration of the nature and implications of quantum field theory. The contributors discuss quantum field theory from a wide variety of standpoints, exploring in detail its mathematical structure and metaphysical and methodological implications. The contributors approach QFT from a variety of standpoints. Part I offers two different interpretations of the value of studying the foundations of QFT as an area of separate metaphysical research. Parts II and III consider the metaphysical and methodological implications of such issues as the problem of the status of virtual particles; the technique of renormalization; and the role of covariance principles. Part IV examines the mathematical foundations of QFT. Harvey R. Brown is at University of Oxford. Rom Harre is at Linacre College, Oxford.